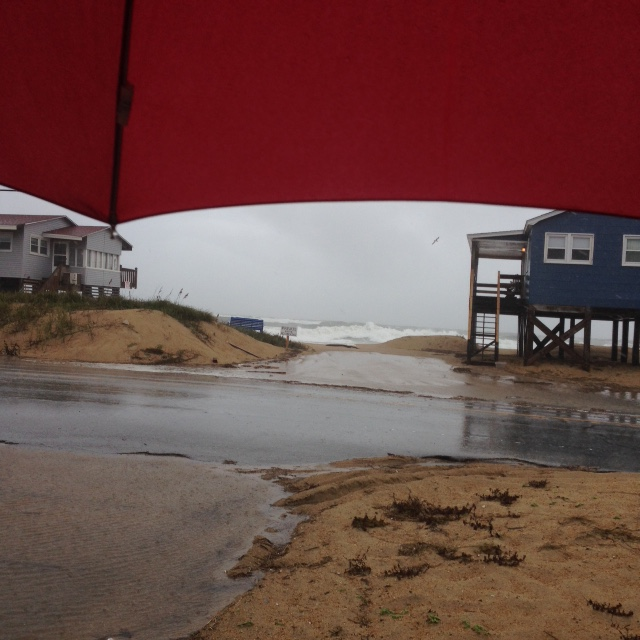 Kitty Hawk on the Outer Banks of North Carolina, October 2nd 2015, 12:01pm – before the harsher rains set in. This morning, I was supposed to be on the road driving away from Kitty Hawk toward the Chesapeake Bay Bridge for a scenic water crossing into Maryland. From there, the plan was to continue a route into New Jersey and eventually Greenwich Village in New York to attend a writers’ conference that I’d impetuously registered for while still in Texas. I could not have known that after my first 24 hours on the Outer Banks of North Carolina, I would look for ways to remain in Kitty Hawk through the winter and into Spring of 2016. All of that was of course before last night, when news of Hurricane Joaquin, now a category 4 storm, flashed across the television screen which now had intermittent connection. I had arranged to leave my belongings in the quaint cottage I’d been renting, but considering how people on social media vilified that dentist who killed Cecil the lion, I did not want to be the woman who took herself inland while Gatita the cat drowned in flooding waters from Joaquin, completely possible if she darted out of the cottage when one of the owners opened the door to check in on her. Better for me to stay put and spend even more time with this walking hairball, locked away with her limited vocabulary and frenetic demeanor. Gatita has decided that all humans, except me, are dangerous and not to be trusted as she hides away every time someone knocks on my cottage door. Some of this is my fault because we have spent too many 24×7 weeks holed up as I peck away on my laptop keyboard while she lays on the table I never use for dining or splayed across my lap demanding that I both type and pet at the same time. She has, I realize, elevated our relationship to a level I never wanted. But this morning, I had bigger worries than a needy cat. I had an empty refrigerator, void of even coffee. In anticipation of being away for five days, I’d exhausted my food sources so I drove to the closest grocery store and chatted up two white-haired senior citizens who have lived their entire lives on the Outer Banks. According to them, they’ve “seen it all.” They said that I didn’t need to concern myself about hurricane water but instead flooding from the rain. Not wanting either of them to worry, I did not mention that I was 100 feet from the soon-to-be-washed-out beach road and 200 feet from the Atlantic. Rain water on the south side of the cottage was creeping closer and closer but the owners who have managed this property through 40 years of storms assured me that I’m fine. To be wise, they are moving me to a cottage across the way that is much higher above sea level. Years ago, I heard a stand-up comic say that he wanted his rain forecasts coming from an 80-year old, arthritic woman with gnarled fingers and in severe pain. The deeper her aches, the higher the barometric pressure, the harsher the rain. Those ladies in the Food Lion this morning, they’re my weather forecasters and not the media’s hype of the Governors of South & North Carolina declaring States of Emergency. In the past when I would see people on the news caught in storms, I always wondered where they went when they evacuated. I don’t think it’s a lack of people wanting to leave so much as it is a lack of somewhere to go. Fortunately for me, I do have an emergency place to hunker down if an evacuation were called. It is inland of Virginia Beach, about an hour and a half drive away. For now, though, I remain somewhat dry and mostly safe in Kitty Hawk. Before the rains came, I walked the sand twice a day — before dawn and before dusk. It was during one of these breezy evenings when I finally let Allan go. The temperature was a perfect 75 degrees with the clouds pushing out the blue to make way for the violet and the descent of an orange sun. The bulk of tourists had retreated back to their cottages and only stragglers like me were sitting on beach towels, taking in the perfection of the sky meeting the ocean. I thought about how Allan and I used to close down each day on the Texas coast with a walk on the beach. The sound of the rhythmic tide created an idyllic moment and automatically I began to whisper, “I wish you were …,” then I stopped, never completing the sentence. I started shaking my head, No, saying No to the impossible, No to the wishing. To have continued wishing for Hook’s presence is almost a form of self-torture, a predictable depression. And this is not the same as missing Allan which I see as entirely different. Missing is reminiscent of the past; Wishing is hope for the future. But, there can be no future with a dead man. I will long for Allan forever, and when I feel sentimental as I often do during morning showers or before falling asleep, I’ll still acknowledge that missing. But never again will I pine for the impossible or say the words: I wish you were here. So with the rising of the waters in North Carolina, I have at last risen to a point in which I take back my life from wishing for something I cannot have to doing and saying things differently, promoting a future instead of drowning in a past. In this way, I set myself free and Hook as well, pushing us to a new level in our separate journeys. Too bad I can’t do the same thing with the cat. Can’t wait to hear your hurricane stories! Wow, is this good for the book or what? Cat lady & feline: safe! Oh thank you Michelle. We weathered the storm or the storm weathered us … I’m not sure! We made it through, Chris! Dear Cat Lady, extending prayers for safety and wishing you continued good writing opportunities. You are such a strong and courageous person, Rosemary. 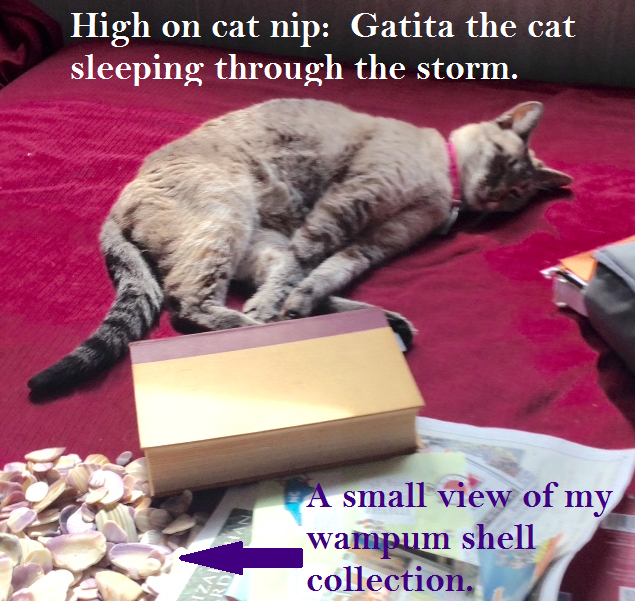 You and Gatita be careful out there! Your writings are lovely. I hope the storm doesn’t get worse. Wishing the best for you. Be safe, friend. You have the rare ability to learn from any situation in which you find yourself. Hugs to you as I anxiously await your next insightful post. Beautiful and poignant, as always. I saw, on the Weather Channel, that much of your beach is washing away. Perhaps the storm will leave some new and interesting treasures, in exchange for the sand? Stay safe, my sister. That was awesome., Love the Atlantic coast — would love to be there — and so glad you took Gaita with you. I guess it was meant to be??? I have faith in your ability to make it through the rain and edges of Joaquin! Plus, it’s more to write about. And we can trade hurricane stories when you get back to Austin.